I'm continuing a runthrough of Kurosawa films this week. 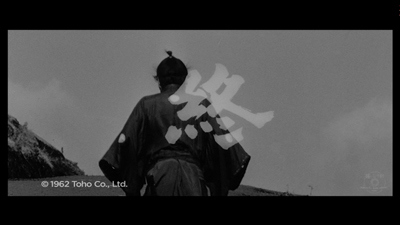 Following on the heels of my review of Yojimbo, I'm going to cover its follow-up, Sanjuro. On Thursday, expect a new review of Ran [here it is], which is currently playing around the country in revival theatres. It's coming to Portland's Cinema 21 on Friday, April 9. Sanjuro was made a year after Yojimbo, and like that film, features Toshiro Mifune as a samurai drifter who can't manage to stay away from people who need his help. In this movie, his alias is that of "30-year-old camellias," trading the berry bush for a flower-bearing tree; yet, he's still almost 40. You can immediately detect a new confidence in this sequel. Mifune's entrance is the kind of cocky appearance that most action stars dream of, but that in the wrong actor's hands, can come off as more smug than genuine. 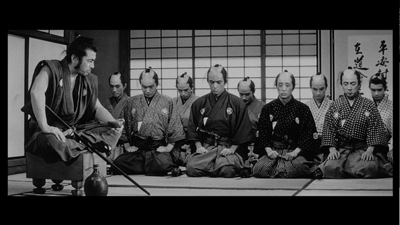 Sanjuro opens with a group of nine young samurai discussing how they will deal with a corruption scandal in their town. Once they've laid out the facts, effectively getting the viewer up to speed, they hear someone stirring in the dark room behind them. Sanjuro has been taking a nap, and he overheard everything. He steps out of the shadows, yawning and scratching himself, and informs these misguided nine that they have it all wrong. The group is lead by Iori Izaka (Yuzo Kayama), and he believes that his uncle, Chamberlain Mutsuta (Yunosuke Ito), is robbing the citizens. The guys have it backwards, though, and the man they reported their suspicions to, Superintendent Kikui (Masao Shimizu), is the real culprit. They misinterpreted Mutsuta's warnings, that even though he is the one who is not attractive and Kikui is handsome, the worst people tend to hide in plain sight. Misjudging based on looks will only get you in trouble--such as assuming the ragged ronin you've just met is not worth the metal in the blade he carries. 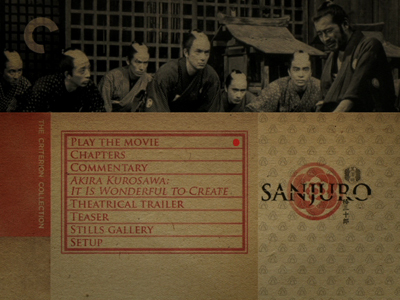 That appearances are deceiving will be a running theme throughout Sanjuro, as most of the action hinges on trickery. Likewise, there is a lesson to be had from doubting the simplicity of the obvious: eventually, Sanjuro and his nine will set up camp right next door to his enemy. The cowboy tropes of Yojimbo are gone, and so are the wide open spaces. 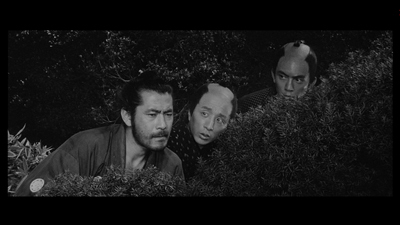 Sanjuro takes place in a more confined environment. Though Sanjuro can save the nine's necks from a raid by Kikui's men, led by the skilled killer Hanbei Muroto (Tatsuya Nakadai, once again taking the role as Sanjuro's main rival), he's too late to stop Kikui from kidnapping Mutsuta and framing him for his own crimes. They set up shop in a home right next to the property of Kikui's main lieutenant, Kurofuji (Takashi Shimura). Again, this is a lesson where someone should have trusted the obvious; Sanjuro picks this spot since he knows the bad guys will never look right under their noses. Who would be crazy enough to move in next door? Most of the first hour of the film is spent trying to figure out where Mutsuta is. Sanjuro tries various schemes to get Kikui to tip his hand, including accepting an offer from Muroto to work for him. 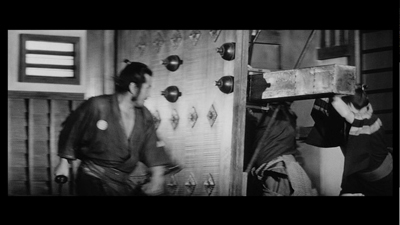 That particular plot ends badly, though not for the audience, since it inspires a spectacular sequence where Sanjuro takes out an entire room of men (even if we are chastised for enjoying it). Each new maneuver is eventually screwed up by the nine samurai Sanjuro has adopted. They refuse to listen to him, only realizing after it has all gone wrong that he was actually right. It's a recurring gag that keeps being funny, even as the consequences get more drastic. There is even a surprising use of anachronistic music to underscore a scene where the young men get excited and want to celebrate their perceived victory. 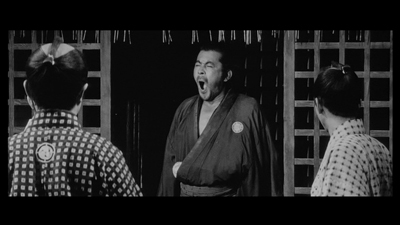 Sanjuro is less serious in tone overall than Yojimbo (even if it's final message is stronger). I realize that may seem odd, since it's not like Yojimbo plays like a lost Bergman film, but the first film has a feeling of doom hanging over it. The town that Sanjuro is saving is already destroyed, and from what we can see, hardly anybody lives there anymore. While men do die in Sanjuro, because the scheming is amongst the upper classes and not down with the peasants, there isn't as much urgency. The attitude of Mutsuta's wife (Takako Irie) sums up my feeling on this. While we are supposed to find her refusal to tolerate Sanjuro killing her captors or to get dirty climbing over a wall to escape as comical, there is also a sort of Marie Antoinette "Let them eat cake" vibe underlying everything she does. These are just the games she knows boys to play, and must they get so serious about it? Sanjuro's reaction to her protests are indicative of a shift in his character. Though the other samurai find him crass and disrespectful, he actually shows real respect for the older woman and listens when she insists he tone down his plans. This includes sending a torrent of flowers downstream as a signal to attack rather than setting Kurofuji's house ablaze. It's not just her, though, Sanjuro himself is more reluctant to kill. 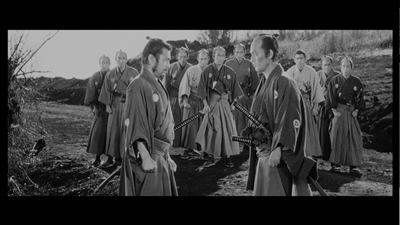 The brigands who were running wild in Yojimbo were bad characters who lived by the sword, whereas the men under Muroto appear to just be hired hands. When they offer no threat, Sanjuro doesn't see much point in killing them. He even gets angry at the nine for forcing his hand. This is an older, wiser Sanjuro, or it might just be that the story has now shifted its interest. Perhaps it's the naïveté of the nine samurai that makes obvious what a more experienced life does to a man. Mutsuta's wife describes Sanjuro as a living sword, but one who has leapt out of its sheath. It's the superior sword that keeps its sharp edge covered, who finds another way. 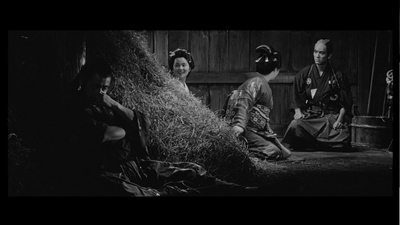 In the last scene of the film, this homily not only comes back, but Sanjuro reveals that he agrees with it. He has left the village now that the work is done, having traded in the kimono of the resistance for the rags he wore at the outset. The newly rescued Mitsuta understands, Sanjuro is not a man who knows how to be contained, and so he must wander. Like the cliché about sharks: keep moving or die. You may encounter death on the road, but that is the risk. The ronin's last act is to teach his pupils a final lesson and show them how horrific killing really can be. It's the most gory display in either film--the dead man has a fountain of blood issue forth from his chest--but it's actually not over the top. 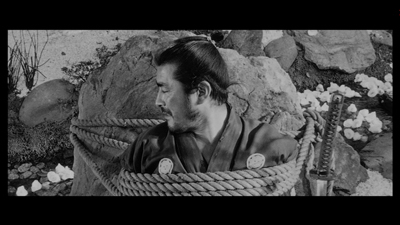 Anything less would be selling Sanjuro's sacrifice short. This is the horror he has endured for the good of these undeserving others. For a light-hearted film, it's a rather dark way to close this chapter, and such is the power of Mifune, he looks like he is carrying the weight of death as he walks off into the horizon. Toshiro Mifune played this character two more times in the early 1970s, though not in films directed by Akira Kurosawa. These future sequels included an encounter with another famous samurai, Zatoichi the blind swordsman. It speaks to the enduring appeal of the character that he would still be popular eight years later, though I think what people were really responding to was seeing Toshiro Mifune pick up a sword again. He could have been playing any character, much the same way that the public always likes Clint Eastwood to put on a cowboy hat. Doesn't matter if it's the Man with No Name or the Yojimbo, we just want to see these icons do what they do so well.